Mapping the Local presents an overview of the major phenomena, trends and issues of contemporary art based on various subjects in each semester; a special emphasis will be placed on the East European region, in the form of seminars, presentations held by invited lecturers, field trips to museums, institutions and artist studios. The course is primarily directed towards Erasmus students as well as local students of the Intermedia and Fine Art Theory and Curatorial Studies departments. While offering an insight into the Hungarian contemporary art scene, one of the course’s main intentions is to develop personal contacts and cultural interactions between local and foreign students fostering an emerging intercultural dialogue. 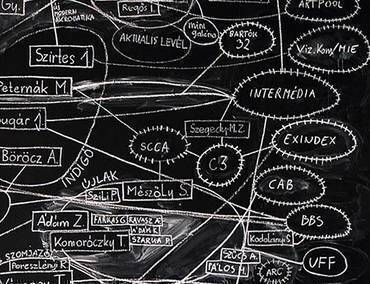 It combines both theoretical and practical methods and is led by Zoltán Kékesi and Szabolcs KissPál, a scholar and an artist. Site Specific Interventions in Public Space is a survey of the evolution of the different art practices relating to site specific and other public art projects or interventions which take place outside of the traditional museum environment, including sculpture, installations, graffiti and performances specifically conceived of as forms of artistic discourse situated in public spaces and/or within the routines of everyday life. The class is taught by artist and author Allan Siegel and includes a discussion of selected theoretical works well as an analysis of significant specific projects and art work. Additionally, drawing upon the discussions and readings, students will apply their ideas to situations and locations throughout the city. Andreas Fogarasi – Golden Lion Award 52nd Venice Biennial; solo shows among others at Museo Reina Sofia, Madrid; Grazer Kunstverein; Georg Kargl – Fine Arts, Vienna; Lombard Freid Projects, New York; Ludwig Museum, Aachen; Ernst Museum, Budapest. Tamás Kaszás – Recipient of Smohay Prize 2010 and Studio of Young Artists Association; exhibitions at W139, Amsterdam; NBK, Berlin; Akademie Schloss Solitude, Stuttgart; Istambul Biennial 2011. Eszter Lázár – art historian and curator of many international group exhibitions with a focus on Contemporary Central and Eastern European Art, lecturer on the Dept. for Art Theory and Curatorial Studies, former curator of kArton Contemporary Art Gallery. Little Warsaw – Collective name for artists András Gálik and Bálint Havas. The duo exhibited at the Venice Biennial; the Berlin Biennial; Stedelijk Museum Amsterdam; GfZK, Leipzig; ApexArt Gallery, New York; and the 7th Manifesta. Their work is featured in Art After Conceptual Art published by MIT Press. Ilona Németh – Munkácsy-prize beholder, exhibitions at Modern Art Oxford; Kunsthalle Budapest; 49th Venice Biennial; Expo Hannover 2000; Ludwig Museum, Budapest; etc. Professor at the Academy of Fine Arts and Design, Intermedia Dpt. Bratislava. János Sugár – Exhibitions among others at Annely Juda Fine Arts, London; Kunstverein, Stuttgart; Exit Art, New York; Jeu de Paume, Paris; Anthology Film Archive, New York; Documenta IX, Kassel; etc. professor at the Intermedia Dept. of the Hungarian Academy of Fine Arts. János Szoboszlai – art historian and curator, adjunct lecturer and head of the Dept. for Art Theory and Curatorial Studies, chief curator of the Institute of Contemporary Art, Dunaújváros (ICA-D), former director of acb Contemporary Art Gallery. Tibor Szemző – graduate of the Hungarian Music Academy, musician, composer and filmmaker, founder of the acclaimed Hungarian ensemble Group 180 and The Gordian Knot Company. The Hungarian University of Fine Arts joined the Erasmus Program in 1998. Over the past thirteen years the number of our partner institutions has grown to 48. Each year 40 students are selected to travel abroad on scholarship and nearly as many international Erasmus students arrive to study at the HUFA. Students studying at the HUFA, besides course work in areas such as sculpture, painting, Intermedia or photography, participate in, and organize, projects and exhibitions on an off campus.